Crystal healing has had a massive resurgence in the past two years. There are over two million crystal healing hashtags on Instagram as I write! So, I decided to take a few of the most notable gem-infused products on a test drive. And, despite the fact that the science behind crystal healing is very flimsy, I still love crystal healing for self-care and beauty. I don’t care if it’s a placebo. The placebo effect is powerful. And thusly, I will continue to fill whatever spaces I can (and those that my husband bans!) with beautiful crystals. I had a good look around because I knew I was going to shoot a video, and write a blog on crystal healing for self-care and beauty. I found a lot of me-to products in each category. Some were not great in terms of quality, so it took me a while to collect the products that I personally love, and will continue to use. This is a huge trend now. My teenage daughter got me fired up because her Instagram feed started to blow up with crystal water bottles. I did a bunch of research, and settled on Vitajuwel as my gemstone-infused brand of choice! Their bottles and decanters are beautifully made, and quite stunning. I have the Via “Wellness” bottle, infused with rose quartz and amethyst. I do get a bit nervous taking it out of the house because I’m terrified it will break. You can purchase a sleeve (made of scuba-type material), but I think that defeats the purpose of carrying a visually beautiful bottle. My favorite is my “Forever Young” Decanter. Yep – the whole family is obsessed because whether or not you believe that it’s going to do anything to your water (they don’t! ), it’s so pretty. This gorgeous decanter takes pride of place on my dinner table whenever I’m throwing a special dinner party. Talk about conversation-starter! If you can’t think of what to buy someone for a wedding present, this would be a really unique gift. Next on my list is CrownJuwel water bowl for my Pomeranian, Sunshine. But I fear my husband will think I’ve totally lost the plot. There are so many wonderful gemstone-infused skin care products flooding the market – I can hardly keep up. For my crystal healing for self-care & beauty post I went with Gemstone Organic Skincare I respect the laborious, but loving process, which makes these products. Debra, the founder, is a Reiki healer and has a degree in geological engineering! She passionately believes in crystal healing for self-care & beauty. She works with the vibrational forces of minerals. Her Gem Juice is a “beauty water”. These gem essences boost the medicinal properties of each plant and increase the healing potential for your skin. She uses color-coded gemstones in the hue of each plant to create a vibrational link between mineral & botanical worlds. Along with the essence, the Gem Juices contain small crystals inside every bottle. These crystals are energetically cleansed and ready to be programmed with your unique intentions. You simply hold the bottle in your hands and let your desires be known. The crystals will vibrate in your favor! When you are done with the hydrosol, you remove the crystals from the bottle and keep them for continued intentional living. I recommend using the Gem Juice as a toner, and layering on of the wonderful organic face cremes over it. This is my favorite category in terms of crystal healing for self-care and beauty. I have always been drawn to wearing healing gemstones. I’ve also tried my hand at making some Gemstone Aromatherapy Diffusing Bracelets (and was very happy with how they came out)! But in digging around for this article, I came across WishBEADS, and fell in love! Wish Beads take “intentional” jewelry to a whole new level. You pick your bracelet by way of choosing the stone (and stone’s description), which resonates with you. You then create your wish/intention and write it on the tiny scroll that’s provided. You insert the scroll into the hollow brass clasp of the bracelet, and wear your wish! Owner, Alexis Fischer, has written a brilliant little work book to help you to make your wish manifest. The Wish Work book invites you to visualize your wish, and put in the work in to activate it! The whole ritual of writing down your intention, wearing it, and doing the work is powerful stuff. 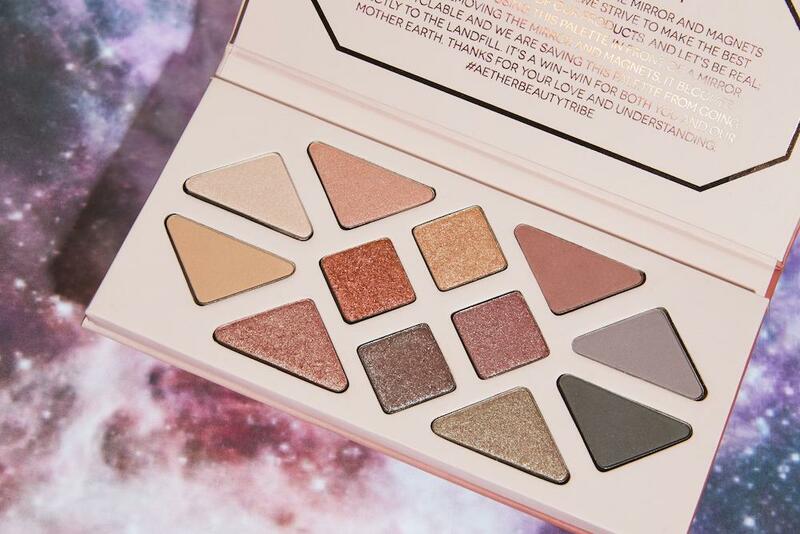 Gemstone-infused Eye Palette For Beauty!